Techniques of Romanesque Fresco Murals, Altarpieces, Illuminated Manuscripts. In the history of Christian art, the term "Romanesque" is a rather vague and principally architectural term that has been extended to other fine art disciplines such as painting and sculpture. If Romanesque architecture is marked by a new massiveness of scale, and Romanesque sculpture by greater realism, Romanesque painting is characterized by a new formality of style, largely devoid of the naturalism and humanism of either its classical antecedents or its Gothic successors. (Put simply: before Gothic delicacy, comes Romanesque severity.) Linear designs predominate, producing majestic calmness or, alternatively, agitated expressiveness. The decorative character of Romanesque stained glass, illuminated manuscripts, altarpiece art and other imagery, can be seen as a sort of bridge between Eastern Byzantine art - with its symbolic, formalized icon painting - and Western Gothic art, with its late 14th century courtly variant known as International Gothic. In general, Romanesque art reflected the rise in political and economic stability across Europe. With stability came higher tax and tithe revenues for the Church, which therefore had more money to spend on new churches - complete with stained glass art, stone statues of Saints, fresco paintings, illuminated manuscripts and the like - which in turn attracted larger congregations and bigger collections. At the same time, the new religious orders (Cistercian, Benedictine and others) opened new monasteries (like Cluny in central France, or St Denis outside Paris), all of which needed various forms of religious art, including inspirational mural painting in their cloisters and refectories, as well as more illustrated bibles and other types of devotional books. Indeed, some art historians view Romanesque art as a reflection of growing monastic piety. In any event, the new Romanesque movement was a tremendous boost for medieval artists, throughout western Europe. The school of medieval painting known by common consent as Romanesque - a term which all historians admit to be even less precise and less clear than the term Gothic - begins in the early years of the eleventh century and ends in the thirteenth, with the birth of the Gothic world. Its precise chronology, however, is hard to establish, for its development took place in different ways and at different times in Italy, Germany, France and Spain. After the period known as pre-Romanesque, which consists of Carolingian Art (c.750-900) and the later phase of Ottonian Art (c.900-1050) - although the latter often lingered on into the middle of the eleventh century in territories belonging to the Empire - Romanesque painting created its own individual styles. In the middle of the eleventh century, Greek artists, brought in by the future Pope Victor III, decorated a number of churches and sanctuaries in southern Italy. This might, perhaps, be the secret of the birth of Romanesque art, but if so, how can we explain the Catalan paintings at El Brull (1062), Durro, Bohi, and those of the Master of Osormort, which are probably of the same date; and in France, those of Berze-la-Ville and Saint-Chef; and even in Jutland, the murals in the church of Skibet? The combined study of style and iconography should enable us to date mural paintings fairly accurately. Unfortunately the destruction of a large number of paintings, which prevents us from acquiring a comprehensive view, makes the whole thing uncertain, and we know that iconographical study by itself can be completely misleading, many themes having been resumed or abandoned by Romanesque artists. Faced with the complicated cross-currents of influences and the simultaneous maturing of styles in places scattered over the length and breadth of Europe, we shall follow the usual method of studying the development of Romanesque art according to the geographical division of the West today. The different techniques of mural painting are: fresco, distemper, wax painting and fresco al secco. For fresco, the mason prepares a certain area of fresh, smooth mortar or plaster on which the painter works directly, with slightly moistened brush full of ground colour. The colour pigments penetrate the mortar while this is drying. This technique requires great skill on the artist's part, since he cannot go over his first strokes or make any corrections. The choice of colours is limited to those derived from earth or chalk: whites, ochres, yellows, browns and reds, all rather subdued in tone. Distemper painting is done, like fresco, on a previously prepared coat of plaster, which in this case is moistened afresh completely. We may call it distemper, although strictly speaking this involves working on a dry surface with colours soaked in water mixed with size. But there is no exact term for the technique, which was chiefly used in France during the Romanesque period. Melted wax painting, which had also been known for centuries and even in Roman times, is carried out by mixing powdered colours with wax, which is melted and introduced into the ground by means of a heated spatula or piece of metal. See also: Encaustic Painting method. Fresco al secco is, more simply, done straight on to the dry plaster. It is done with colours slaked in water to which is added either white of egg or glue made from fish bones or rabbit skins, which serves to fix the colours. For panel paintings (altarpieces) and illuminated manuscripts (book paintings), the usual painting method was tempera. For details of medieval Italian painting across Central Italy, Northern Italy, Tuscany, Lombardy, Venezia and Friuli, and Italian Switzerland, see: Romanesque Painting in Italy. For details of the differing French Romanesque schools in Maine, Anjou, Poitou, Berry, Orleans, Saint-Savin, Burgundy, and the Auvergne, see: Romanesque Painting in France. Romanesque miniature painting (mostly paintings in illuminated manuscripts) developed alongside murals of the period. Rome, Cluny, Salzburg and Canterbury were important centres, and attracted the best miniaturists from all over the Continent. 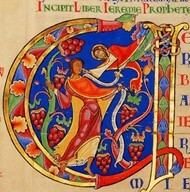 Important works include: Moralia Manuscript (c.1111); the St Albans Psalter (1120-30); the Psalter of Henry de Blois (1140-60); and the Lambeth Bible (1150). For details of Spanish paintings from the pre-Gothic period (c.1000-1200), in Gerona, Roussillon, Catalonia, Sigena, Castile and Leon, and Majorca, see: Romanesque Painting in Spain. For a comparison with contemporary styles from the East, see also: Russian Medieval Painting (c.950-1100). It is difficult to form any general idea of Romanesque wall painting in England. Only the large number of illustrated manuscripts preserved in libraries testify to the vitality of Romanesque art in this country, for the frescoes which were undoubtedly a leading feature of this art have almost completely disappeared. There are only a few churches which still retain part of their twelfth-century decoration. At Hardham, in the south of England, the interior of the small church of St. Botolph was once entirely covered with fresco paintings. In the nave, on the west (entrance) wall, we can still recognize scenes from the Apocalypse, although these are considerably effaced. On the east wall, above the arch opening onto the choir, we see the Lamb in a medallion, worshipped by two angels. On the same wall, further to the right, there begins a cycle of the Childhood of Christ which is continued on the upper register of the south wall and again on the north wall, ending on the left of the Lamb: the Annunciation, the Visitation, the Nativity, the Adoration of the Shepherds, the Star appearing to the Magi, the Epiphany, the Magi before Herod, the Adoration of the Magi, Joseph's Dream, the Dream of the Magi, the Flight into Egypt, the Massacre of the Innocents, and either the Presentation in the Temple or the Child Jesus confronting the Doctors of the Law. On the middle register, there is a series of hagiographic scenes, including the story of St. George, while the lower register shows a background of hanging draperies. In the choir, the paintings on the lower register are practically undecipherable, and on the upper register there only remain two Seraphim from what must have been a Christ in Majesty, together with two paintings on the west wall, one representing Adam and Eve, the other probably Eve suckling her child. On the other wall we have the Elders of the Apocalypse and the Apostles. The paintings at Hardham, like most of those still to be found in England, appear strongly influenced by the Romanesque Biblical art of the Continent, the heir to Carolingian traditions. We recognize the same influences and the same styles in a whole series of country churches in Denmark (Orreslev, Jorlunde, etc). Further to the north-west, at Claverley near Wolverhampton, the little church of All Saints still shows a few fragments of mural decoration. A frieze of fifteen horsemen, although extremely crude in execution, recalls the Bayeux tapestry, particularly in the drawing of the faces; it cannot be considered merely as reflecting some romance of chivalry. Some authorities have interpreted it as the encounter between Roger de Montgomery and the English at the battle of Hastings. Others see in it a Psychomachia, showing the victory of the virtues over the vices. We find another example of the influence of Continental Romanesque art in the frescoes of the charming little church of St. John the Baptist at Clayton. Here there is already a stronger Oriental influence, and we recognize Byzantine elements adapted to the Benedictine manner of the Cluniac style. The two details reproduced: Christ entrusting the Gospel to St Paul and the Saint, shown in the enclosure of the Heavenly Jerusalem, with his garments indicated by a conventional double line, still have a certain kinship with the Hardham frescoes, but the pattern which forms the background of all these compositions, bands of red, ochre, white and black, is much more Oriental in feeling. These paintings were most likely executed towards the middle of the twelfth century. The monastic centre of Canterbury, in the duchy of Kent, maintained more direct and more frequent contact with Rome than the rest of England. For this reason, the frescoes in its cathedral display a powerful Byzantine influence. In the crypt, the chapel of St. Gabriel must have been reinforced after the fire of 1174, and the fragments of painting which subsist in the apse are visible only in artificial light. They have an amazing freshness of colour. On the vault we see the Heavenly Jerusalem, and Christ in a mandorla supported by four angels; on the north wall the annunciation to Zachariah; below, the story of St. John the Baptist, his birth and naming and to the left of this scene, a hieratic angel in the Italian-Byzantine manner. These paintings date from the third quarter of the twelfth century, while those of St. Anselm's chapel, which opens on to the choir of the cathedral, are posterior to the fire of 1174. Of this chapel's decoration only a single panel remains: St. Paul being bitten by a viper. This subject, taken from a passage in the Acts of the Apostles, was rarely depicted by painters. The execution closely resembles that of the paintings in the crypt, although it has greater refinement and more colour. Finally, in Winchester Cathedral, the paintings in the chapel of the Holy Sepulchre, although still showing Byzantine influence, foreshadow the advent of the Gothic spirit. The iconographical theme of this chapel, which is used particularly during Holy Week, is concerned with the Passion. The attitudes of the figures in the Descent from the Cross, or that of Mary Magdalene, remind one forcibly of the paintings of Montmorillon, although they reveal an even stronger naturalistic tendency. For an insight into the creation of such treasures of book painting as The Winchester Bible (1160-75), see: Making of Illuminated Manuscripts and History of Illuminated Manuscripts (600-1200 CE). Germany and Austria witnessed so profuse an artistic efflorescence between the ninth and the eleventh centuries that it is difficult to distinguish precisely between Romanesque wall paintings and those which preceded them. (See also: German Medieval Art c.800-1250.) The almost total disappearance of mural decorations executed during the Romanesque period, together with the disastrous restorations of the nineteenth and twentieth centuries, have further added to the difficulty. In the Isle of Reichenau (Lake Constance), the church of St. George, which was dependent on the abbey of Oberzell, as well as the church of Unterzell are decorated with religious paintings which unfortunately are in very poor condition. These paintings, which were subjected to two deplorable restorations, then covered with a coat of distemper, and retouched again when they were uncovered in 1880-2, are in spite of all this one of the best examples of Ottonian art still to be found. In the nave of St. George of Oberzell, the paintings - they are the oldest - are set out on three registers. Below, between the arcades which divide the central nave from the side-aisles, we see saints and prophets, while the upper register is decorated with figures of apostles. The middle register depicts Christ's miracles: the devils driven out of the possessed man at Gerasa; the healing of the man born blind and of the woman with dropsy; Jesus stilling the tempest, in which Our Lord is shown twice, first asleep and then stilling the waters; the cleansing of the leper; then, in one single picture, the healing of the woman with an issue of blood and the raising of Jairus's daughter; and finally the raising of the widow's son at Nain and the raising of Lazarus. 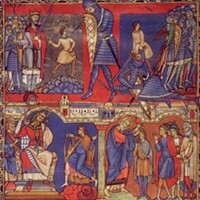 Many historians consider this series of paintings to be the oldest, and ascribe it to the beginning of the eleventh century, on the basis of its evident kinship with the Evangelarium of Otto III, originally at Reichenau, and dating from about the year 1000. The altar-front dedicated to St. Waldburga, painted about 1180, gives only a faint idea of what mural painting in the Lower Rhineland must have been. Ratisbon, now Regensburg, in Bavaria was one of the great centres of Romanesque art, and famous for its school of miniaturists. The murals in the chapel of All Saints, in the cathedral cloister, and those of the Abbey church of Prufening, a few miles away, are in too bad a state to be reproduced. They allow us to discern, underneath the deplorable nineteenth-century restorations, the powerful Byzantine influence which spread, under the impulsion of the Benedictine movement, throughout northern Italy, southern Germany, the Tyrol and eastern France. At Salzburg which, like Ratisbon, was a great cultural centre in the twelfth century, the almost total destruction of medieval churches and the disappearance of the Romanesque cathedral deprives us of any frescoes earlier than the twelfth century. The most important paintings of this branch of Romanesque mural art are those preserved in the convent of Nonnberg at Salzburg, which was exclusively for ladies of noble birth. The nuns' choir, a room adjoining the west wall of the church, contains niches in three of its walls in which are painted busts of saints. Although incomplete, these frescoes bear witness - through the purity and harmony of their colours, the beauty of the heads, with their Byzantine nobility, and the richness and skilful modelling of the martyrs' silken robes - to a considerable acquaintance with the traditions of Greek art or at least Byzantine models. The spread of influence from Aquileia and Venice to Salzburg brought about the creation of local schools, which in their turn amalgamated the new Italian-Byzantine tendencies with the contributions of thirteenth-century Germanic art. An example of the complexity of the cross-currents typical of the whole Romanesque period is seen in the frescoes of St. John's chapel, at Purgg. The decorations of this little mountain sanctuary, which date from the very beginning of the thirteenth century, depict, in the choir, the Lamb with its traditional worshippers, while the triumphal arch is painted with the Offerings of Cain and Abel, and with donors' portraits. In the nave, three religious subjects without any direct relation between them: the Nativity, the Miracle of the Loaves, and the Parable of the Wise Virgins, are completed by a secular scene, the war between mice and rats. On the old main road which, by way of the Via Mala and the St. Bernard Pass, connects Italy with the district of Lake Constance, the church of St. Martin at Zillis provides a marvellous surprise: its wooden ceiling, divided into one hundred and fifty-three panels - a unique picture-book, the only Romanesque painted ceiling preserved almost in its entirety - on which is displayed the whole medieval cosmogony, with its Heaven and Hell and its fabulous creatures. Its conception shows great boldness, and its execution amazing harmony. Grey, olive-green and sky-blue are the dominant colours, against which the reds stand out with extraordinary vividness. The border includes some forty fish-tailed monsters with a variety of bodies: dragons, mermaids playing horns, harps or violins, a monkey riding astride a fish, and so on. Within this framework is depicted the life of Christ, with the miracles and scenes from the Passion. This ensemble is completed by a few episodes from the legend of St. Martin, patron saint of the church. This ceiling at Zillis, painted in the middle of the twelfth century, is one of the treasures of Romanesque art. If it cannot claim to show the hand of a master painter of inventive genius, yet it bears eloquent witness to the value of a distinctive style. Historically, Hungary undoubtedly played a most interesting role in the development of Romanesque art. Its churches are important from the point of view of Romanesque architecture and sculpture, but they have for the most part lost the paintings which they undoubtedly once possessed, and which must have been marked by Oriental influence. A few samples survive, among them the paintings in the lower church at Feldebro, where the busts of Christ and the saints, and the Offerings of Cain and Abel, are in a definitely Western Romanesque style. In Czechoslovakia, a very complete set of paintings, dating from about 1134, entirely covers the walls and the cupola of the circular chapel, dedicated to St. Catherine, of the castle of Znojmo. In the lower zone are shown scenes from the life of Jesus, and above, a most interesting series of scenes from the legend of Przemysl. The centre of the cupola is occupied by the Dove of the Holy Spirit, while around it are four seraphim alternating with the four evangelists writing, each underneath his symbol. In the lower part of the cupola, between the centre of the dome and the walls, King Vratislav and eighteen knights of his family are shown under arcades. The whole effect is very splendid, in a free and expressive style which is definitely Romanesque. At Stara Boleslav, the church of St. Clement (twelfth-century) is decorated along the top of the west wall with scenes from the legend of St. Clement, the Pope, with a frieze of meanders, while the lower part is covered with large circular medallions in which are female figures, haloed, probably allegorical. Again in Czechoslovakia, at Albrechtice, the frescoes in the apse of the church of St. Peter and St. Paul (second half of the twelfth century) have been restored, except for a few fragments which include the figure of a priest before an altar with his two assistants. We may also mention, at Prague, an angel, full face, in a window recess in St. Peter's Church, and at Rovna, in the apse of the church of St. James, Christ in a mandorla supported by angels, with the Mission of the Apostles all around, and below, the Life of St. James; in the nave, the Life of Jesus. Outside the Byzantine group in Gotland - the great centre of trade with Novgorod (see, incidentally the Novgorod School of Icon Painting (c.1100-1500) - Romanesque painting in Scandinavia shows an obvious connection with Great Britain on the one hand and Germany on the other. The same is true as regards architecture and sculpture. Wooden churches were very plain and quite unpretentious. Unfortunately only a few examples are left, such as the panel paintings preserved in the Stockholm museum, which may have belonged to an altar and probably did not form part of a mural decoration. Only those churches which were built of stone or masonry have sometimes preserved their decoration. Of the two oldest Danish examples, the Romanesque cathedral of Roskilde has disappeared and been replaced by a building of later date, while only copies remain of the frescoes of the royal church of Jellinge. But something of their art can be found, although in a stiffer and more archaic style, in the remains of Tamdrup and 0rreslev (both c.1125), where the intrados of the triumphal arch shows the Offerings of Cain and Abel, under a medallion of Christ. This vigorous type of art, with its strong outlines and geometrical designs, is also to be found in the churches of Kirke-Hyllonge Saeby and Jorlunde. Ferring contains a very curious set of paintings, based on ancient traditions and treated in a popular style. There still remain, moreover, a number of murals, painted as early as the middle of the twelfth century, in which varied elements are mingled. The frequent use in ornamentation of broad bands with a meander pattern of Classical origin, the prevalence of scenes with stiff and stylized, almost geometrical, figures, are common to a whole group of churches: St. Ibs of Roskilde, Gildebronde, Todbjaerg, Raasted, Sindbjaerg, Faarup, Fjenneslev, Maalov, Skibet - the fresco of horsemen here is one of the masterpieces of Romanesque painting - and many others. In another group of churches of later date - at Sostrup, Aal, Farup, Vislev - contacts with insular and Germanic Byzantinism can be recognized more or less clearly. The Romanesque frescoes of Sweden can be divided into two groups: those in the southern part of the country - Skania (which for centuries was attached to Denmark) - and those of the north. Unfortunately most of them have suffered from nineteenth-century restoration. We may cite among others the churches of Va, Ovraby , Lackalanga, Finja and Vinslov. Romanesque paintings can be seen in some of the oldest churches and cathedrals, as well as the best art museums in the world. For later styles, see: Gothic illuminated manuscripts followed by the more decorative and courtly International Gothic illuminations. We gratefully acknowledge the use of material from Romanesque Painting by Juan Ainaud & Andre Held, a book we recommend for any student of European paintin (c.1000-1200).  For the meaning of medieval frescoes and altarpieces, see: Famous Paintings Analyzed.  For information about medieval painting and sculpture in Europe, see: Homepage.